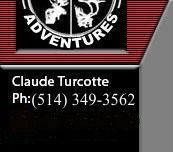 Big Bear Hunt Adventures: Claude Turcotte Guide&Services, guaranteed. 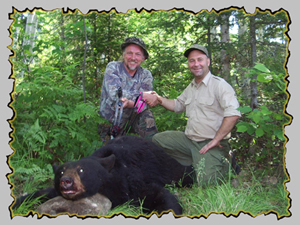 a trophy black bear, BigBearHunt Adventures invites you to join us for an incredible adventure. we’ve never yet had to pay back a bear hunt! 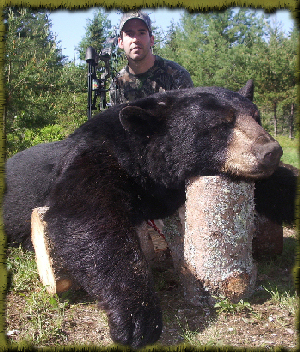 We have a maximum of 40 bear hunters per season, so hurry to make your plans now! Explore our web site, visit our photo galleries and e-mail us for pricing or additional information today. 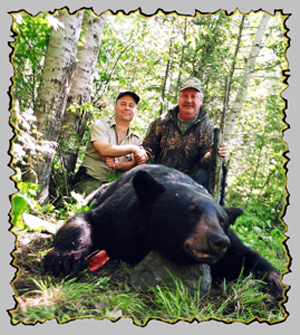 Claude Turcotte’s Guide Services has access to thousands of miles of prime bear country, located in exclusive, restricted and controlled Provincial Wildlife Reserves in the eastern Canadian province of Quebec. All of our areas are via easy access paved roads within a 2 & 3 hours drive from Montreal. Bear Season begins in mid-May and runs through June, with the rut going on in June. We offer three base camps, two guided and one self-guided. from the Montreal International Airport. Only 4 groups accepted in 500 mi.². Only 24 hunters accepted in 500 mi.². made of 500 miles of untouched wilderness area where no hunting is allowed. we estimate they’re even higher. So due a steady growth of the population, biologist had increased our quota for the first time since over 10 years. So this years those extra places will be offer in a SelfGuided type hunt. We want to make this the hunt of a lifetime. We offer all kinds of stands to accommodate all weapons and physical conditions, over very fresh and active baits. In the past 15 years we have had a 90% kills on mature bear. We guarantee a shooting opportunity or you come back FREE! 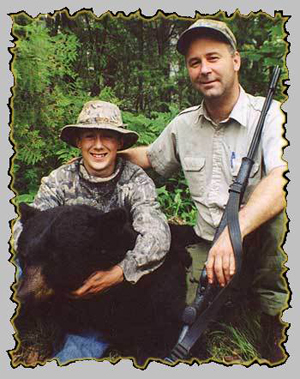 Harvested bears will be tracked, gutted and skinned by your bear hunting guide. If needed a taxidermist is also within the camp, should you want to preserve your trophy. Airport pickup service is available upon request. However, we recommend making your own transportation arrangements to allow you the convenience and potential cost savings by having a vehicle at camp. Hunting license are reserved for you, after you’ve booked, we’ll send you a gun declaration form to facilitate your passage at the border. The cost of a 6-day hunt ranges from $1499 to $2999 depending on the time of season and the type of hunt (plus taxes and license fees). Space is limited! Email us now to reserve your hunt and take advantage of our Action Guarantee. Booking now for Spring 2010 and 2011. 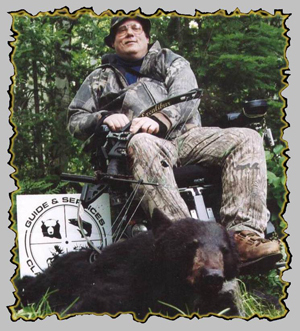 BigBearHunt Adventures is committed to getting disabled bear hunters into the woods for a great hunt.